We can help you to arrange bike hire and shuttles for the different tracks in the area, ask at reception. The Fishers Track is a 95% DOWNHILL..!! SPECTACULAR SCENERY!! A short, easy climb leaves you with breathtaking views of Mt Ruapehu, Mt Ngauruhoe, Mt Tongariro and out over the Retaruke Valley and beyond. The track winds through spectacular native bush before descending down through farmland. Overall the track is 17km long and includes a 520m descent. This adventure requires minimal fitness levels, is suited to anyone who can ride a bike. The Old Coach Road gives a historic and unique glimpse into New Zealand’s past, taking you through beautiful stands of forest with sweeping views of the surrounding county side. 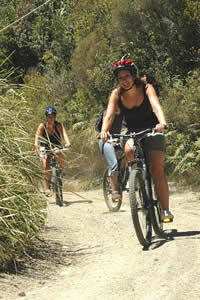 The trail is approximately 15 km long so is an achievable return ride for a day or an interesting half day one way trip. Heritage features on the trail include massive steel viaducts, a curved tunnel, railway bridge remains, old camp sites, and a cobbled road built in 1906. No other road of this age, length and surface exists in New Zealand. The Department of Conservation has erected displays along the way to keep you well informed. This is one of the premier rides in the North Island. Renowned for the long and often rutted down-hills, the track will test even the most ardent biker. Also known as the Tongariro Forest Crossing, taking 46km (4-7 hours) on old logging tracks through remote native bush, the track surface varies from gravel to mud, some stream crossings, and there are inevitable up-hills. The scenery is outstanding! From wide vistas of all three volcanoes to lush unspoiled New Zealand bush. This is a unique track, you can either enjoy the magnificent beauty with your family on a more relaxed and peaceful outing or with your hooning friends. 3km from Horopito on Middle Rd, a mix of 4WD & single tracks. A good area for exploration. For the experienced riders who like a challenge, this is perhaps the best ride in Tongariro Forest. It’s only a 40km loop, but it takes 4-7hours and excellent navigation skills. You will encounter every type of riding imaginable on this beauty. Go 3km South on SH4 from National Park. The Old Waikune Prison is on your left. On your right is the Pines. There is a tarsealed road across the railway tracks on your right that heads down to the old mill site. This is the old forestry area the prison used to mill. Throughout the pines are great tracks. Pick up a map from the BP garage at National Park Village. 30 km North-West of Raetihi. Follow the Mangapurua Track across farmland, into the bush and almost all the way up to Mangapurua Trig. Near the top, a 5-minute walk is signposted to the trig, which has fantastic views of the Volcanic Plateau and Mt Taranaki. Additional information from “Classic New Zealand Mountain Bike Rides” ISBN 0-9582673-0-8. 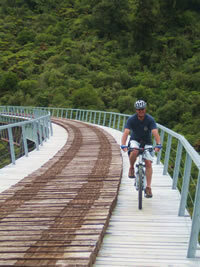 See the website for many more tracks in the area and a comprehensive resource of New Zealand mountain biking.